Safeway recently asked some food bloggers to try out some of their recipes from their holiday recipe collection and I was happy to be chosen to create a dish. I know if you read food blogs like mine you know about the Internet as a source for recipes, but you might not have thought to search on grocery store pages for recipes. In fact, they have a ton of recipes, most using only a few ingredients easily found in the store (a plus), and most fairly straightforward for the busy home cook. When I’m cooking for the holidays, at times I like to create elaborate multi-course meals but for other dinners I like to have a go-to dish that can be prepped ahead of time, thrown in the oven, and will cook while I socialize with my guests. 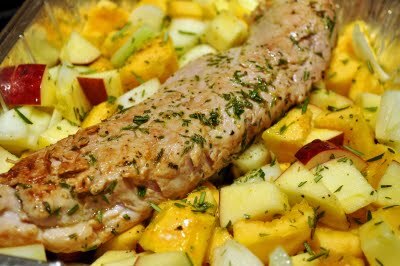 This pork tenderloin recipe is one of the latter ones, and that’s why I chose it during this busy holiday. …while you sear the pork tenderloin. Add the tenderloin to the vegetables, pour an apple cider glaze over the top, and roast the whole dish together. It was night time and my guests were hungry, so I didn’t capture a cooked photo (meat doesn’t always photograph well anyway! ), but I promise you this is easy and elegant at the same time. You can make this for a weeknight family dinner or save it for a holiday party. Hope you like it! 3. Season pork with remaining salt and pepper. In a large ovenproof frying pan, heat remaining 2 tbsp. olive oil over medium-high heat. Add pork and cook, turning once, until browned on both sides, about 10 minutes total. Pour reduced cider over pork and transfer to oven. Bake, basting occasionally with cider, until a meat thermometer inserted in thickest part reads 145 degrees, about 20 minutes. Remove from oven, tent pan with foil, and let rest 10 minutes before slicing. 4. Serve pork sliced, accompanied by cider pan juices and roasted vegetables. Wow, this looks delicious, Michele! I'll have to put that on my list to make.